President Freeman Hrabowski welcomed the Hilltop Society—individuals and organizations that contributed $1,000 or more in the previous fiscal year—to campus this week to thank them for their generosity and support. In addition to festive conversations and mingling with friends, donors learned about research conducted by University professors. Erin Lavik, professor in the Department of Chemical, Biochemical, and Environmental Engineering, talked about three major projects her lab is pursuing. 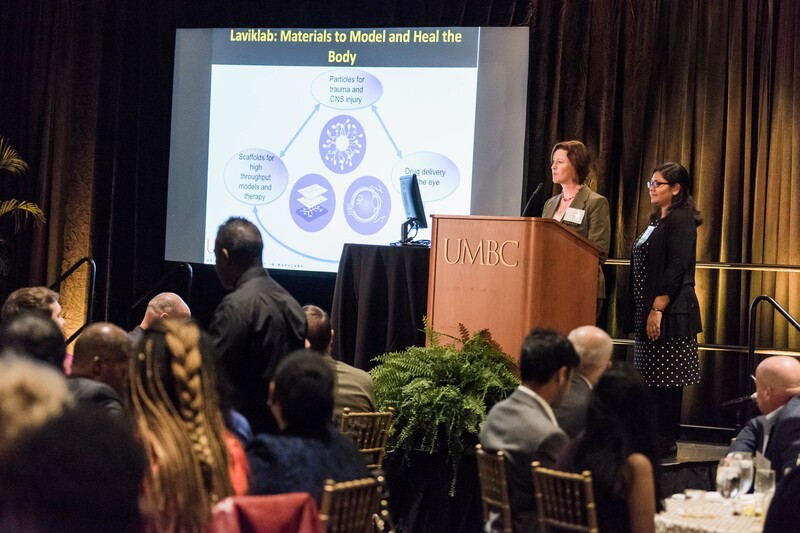 A graduate student, Nuzhat Maishah, further described using nanoparticles to stop bleeding, which has practical applications for first responders treating serious traumas. Kevin Omland, professor in the Department of Biological Sciences, described his studies on the critically endangered Bahama Oriole.Each year, he takes a group of students to the Bahamas to record bird populations and examine possible reasons for their demise.Undergraduate student Matt Kane then described his research on the Black Rat, which may be a predator of the Bahama Orioles. See more images from the evening here. Photos by Marlayna Demond ’11 for UMBC Magazine. Learn more about how you can become a member of the Hilltop Society here.